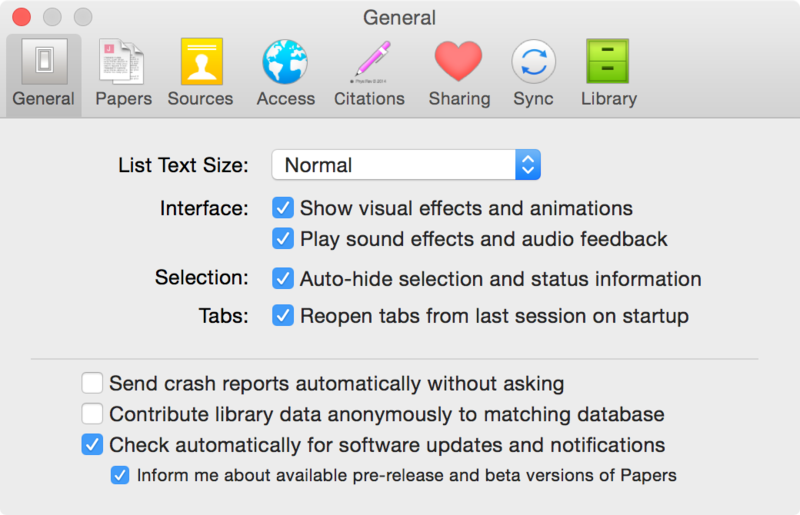 It is possible to receive a notice when we release a beta version of Papers 3. These pre-release versions are created to test new features we are working on before we officially release an update to all users. One thing to keep in mind if you use a beta version is that some things might not work perfectly, and we cannot offer full support. You might encounter bugs, or the application could at times be unstable. The upside is that you get a first sneak peak at the new features we are rolling out, and fixes for possible existing bugs. By beta testing and reporting issues back to us, you are also helping us create a better and more stable application. When more users test new beta versions, we can find and fix bugs faster. Whether you sign up as a beta tester or not, we recommend you always made backups of your Papers library to protect against corrupted and lost data. As a beta tester, you are responsible for carefully backing up your data. Read more about how to keep your data safe in this knowledge base article. You can also keep an eye on the latest release notes for the latest beta. Now that you've decided to test drive our new beta versions, on to the exciting part! You can register to receive new beta versions of Papers from within your Papers Preferences menu. Check the box next to "Inform me about available pre-release and test versions of Papers"
If you encounter a bug or a problem while using a Papers pre-release, you can let us know by reporting it on our support site. Thank you for your interest in helping us improve Papers!